This is a silver denier of Valence and Die - an archbishopric in France. 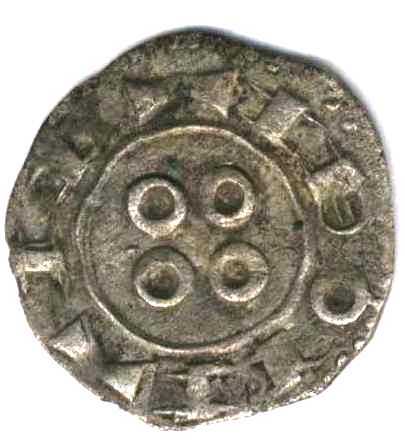 This coin has a very interesting portrait in the center of the obverse with the legend VALENTIA URBS (City of Valence). There are two interpretations of this representation - one is that it is an eagle, the other is that it is an angel. I incline toward the latter - an eagle wouldn't have "feet" like that regardless of the skill of the artist. But the head looks rather avian, doesn't it? 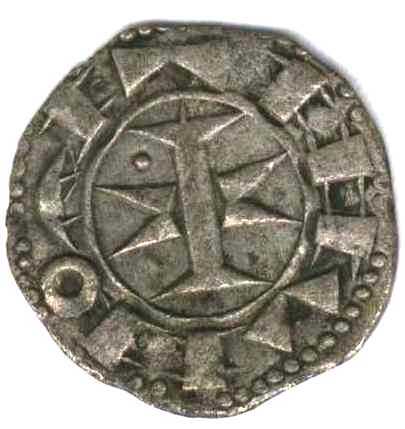 The reverse shows a different representation of the usual short cross - the ends appear to be shaped like shovels with a crescent in the lower left quadrant. The reverse legend states +S'APPOLLINARS - St. Apollinaris - the patron saint of the cathedral in Valence. 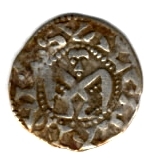 This coin was minted in the mid 13th to early 14th century. It is in F (Fine) condition.